3D printing technology that can form fine three-dimensional structures by ejecting plastic material through inkjet nozzles has drawn considerable attention recent years. 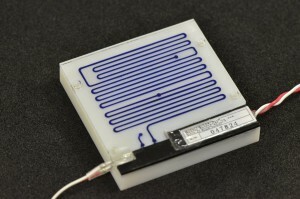 Our group has focused on this technology to check the fabrication potential for micro-channels. We have already investigated the accuracy of fabrication of the micro-channels up to 300 um width. In addition to it, we have introduced laser caving technology that can make 100 um width and 100 um depth micro channels on the 3D-printed structure. In this paper we demonstrated 3D fabricated structure with not only horizontal micro channels, but also 3 D micro fluidic system. Figure 1 shows 3D fabricated chemical analysis system. This system consists of two units. The one is a chemical analysis unit and the other is a controller unit with wireless communication device. The size of each unit is 60 mm cubic. The chemical analysis unit has a balloon-type reagent storage that can release reagent driven by sample inlet pressure. The sequence of reagent and sample release are controlled by latch-type valves, and they are mixed in micro-reaction channel. The micro-reaction channel module consists of three layers, which are an optical flow-cell made by 3D printer, a micro-reaction channel by laser carving technology on double side adhesive sheet and PMMA cover. The controller unit has four functions, which are a wireless communication circuit, a fluid control circuit for valve sequence, a state monitoring circuit for pressure and absorption measurement, and a self-energy management part. The wireless communication is done based on ZigBee protocol that can construct mesh network. Each controller unit and computer can communicate up to 1 km. Figure 2 shows a measurement result of NaClO in water sample (2 ppm) by using SBT method with the analysis system (refer to fig. 1). The light intensity that has passed through the optical flow-cell was measured by photo diode. This result shows the micro-reaction channel made by 3D printer and laser caving technology is available for reagent chemical reaction and optical measurement. We demonstrated the fabrication potential of 3D printing and laser caving technologies, that is for not only micro-reaction channels, but also 3D micro fluidic system.